In the early hours of a large-scale crisis, our nation’s communities and citizens rely upon its local first responders. In order to serve others, our responders train in their area of specialty and also prepare contingency plans to shelter their families out of harm’s way. Responders either rely on a pre-formulated plan and or may need external support in the first hours of a large-scale crisis to ensure safety and shelter of family members and/or other dependents. Inasmuch, it could be prudent for fellow Americans to develop a neighborhood contingency policy and culture of support for families of its local responders. Doing so would help ensure responder availability by minimizing a potential conflict between duty to response and family in the first hours of a large-scale crisis. A neighborhood contingency plan to care for its first responders’ families in the first hours of a crisis could help reinforce the local response capacity and thereby sustain community resiliency. Americans depend upon their local responders in the initial hours following a crisis. What many don’t realize is that a large percentage of our nation’s firefighters serve in a volunteer capacity. Whether career or volunteer, all firefighters are essential to the local response capacity. In addition to specialized training, the volunteer firefighter must also engage in local fundraising to support the necessary costs of its commitment to the communities in which they serve. In the absence of a department suggestion or mandate, it is conceivable that volunteer firefighters may not have the resources or support mechanisms in place to readily formalize a contingency plan to care for family members and optimize the likelihood of their availability to respond. Therefore, the volunteer responder may especially appreciate, if not already rely upon, neighborhood support. According to a 2016 voluntary census by the U.S. Fire Administration, 71 percent of U.S. fire departments were categorized as volunteer, 16 percent as mostly volunteer, eight percent as career and five percent as mostly career. As of April 8, 2016, the U.S. Fire Administration census indicated there were more than 1 million firefighters nationwide, representing about 88 percent of the fire department personnel, of which 56 percent were categorized as volunteer. When developing community preparedness plans for a large-scale crisis, leaders should consider establishing a neighborhood policy and planned effort for first responders by ensuring there is a viable plan for the shelter and safety of their families. This could include a neighborhood volunteer and responder family buddy system, enabling and affording the local responder the ability to remain committed to crisis response rather than focused on concerns for family emergency shelter and safety. 2013 National Service Award presentation at the Port of New Orleans to the US Coast Guard for “Spirit in Duty.” Presented by LTG Russel L. Honore’ (U.S. Army, ret.) and Dan Connole (private sector) and accepted by Capt. Frank Paskewich (USCG, ret. 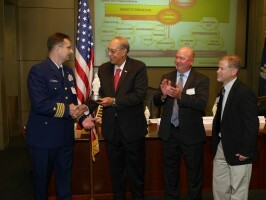 ), and US Coast Guard Sector New Orleans Commander, Capt. Peter Gautier, represented by Capt. Philip Schifflin. Just as ReadyCommunities Partnership has defined a corporate crisis response officer for pre-identification of assets, resources and collaboration with the local public sector to reinforce the local response capacity, neighborhood leadership might consider standing up a neighborhood (block) crisis response officer. Smartphone app developers could develop a secure application for the neighborhood (block) crisis response officers in support of responder family sheltering and other necessary provisions. Various volunteer neighborhood programs geared toward citizen safety and crime prevention might also be reviewed and augmented to address care for responders’ families. Organizations that have established community volunteer support for families of victims include the Coastal Crisis Chaplaincy in Charleston, S.C., and the Glendale Fire Department’s Volunteer Crisis Response Team. In the spirit, manner and commitment demonstrated by these organizations to support victims’ families, the volunteer component could serve as models for development of a neighborhood (block) policy for responder family support. Our nation’s responders are exceptional given their meritorious commitment to service. Those who have selflessly served with honor have earned our respect and support. Since 2007, the National Service and Sacrifice Awards program of the ReadyCommunities Partnership has recognized citizen, volunteer and paid responders for their commitment and acts of service to America’s communities. Past awardees have included, and are not limited to, the New Orleans police, emergency medical service and fire departments who received the 2013 “Service in Community” award and the Floyd County, Kentucky, Rescue which received the 2007 “Response and Containment” award upon the 50th anniversary of exemplary service. Together, let us continue to plan for how local citizenry might assist in developing plans to care for responder families and dependents so our nation’s responders can effectively remain committed to their calling.